This is one of those meals that it so incredibly simple to throw together, it’s now become a “Fend night” go-to on Fridays when I can’t conjure up anything from leftovers. I’ve changed my shopping strategy to hit the grocery store after work on Fridays, which means I can quickly add the very few ingredients I need for this dinner to my list, get it all home, and have dinner on the table just about 15 minutes after walking through the door. You can add bread to this if you’d like, either in the form of buns for the sausages or crusty slices topped with the salad, bruschetta-style; but we only do this infrequently, and frankly, no one really misses it. Preheat a grill, or if you’d like to roast everything instead, preheat your oven to 400 degrees. Toss the peppers and zucchini or eggplant in a medium bowl with the olive oil, salt, pepper, and oregano. 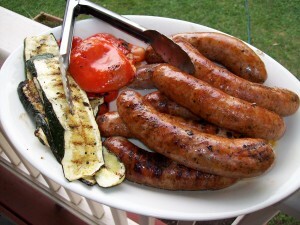 Place the sausages and vegetables in a single layer on the hot grill (or lay in a roasting pan and set in the oven). Grill the vegetables for about 3-4 minutes per side, until they have nice grill marks and are tender but still hold their shape. (The peppers may take a couple of minutes longer and will keep some bite to them.) Remove the vegetables from the grill and spritz with the lemon juice, if desired. Grill the sausages for about 6 minutes per side, until they’re firm to the touch and the skins just begin to split. 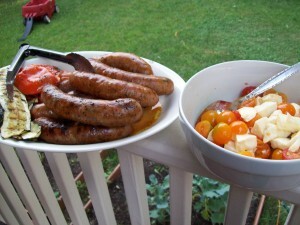 Serve with the grilled vegetables and the caprese chopped salad. Rub the inside of a salad bowl with the halved garlic clove. Discard the garlic. In the bowl, combine the remaining ingredients and toss thoroughly. Taste, adjust seasonings, and serve with the sausages and grilled vegetables.